On 8th October 2013, the European Woman Champion of 2011, GM Viktorija Cmilyte paid a visit to Brussels upon invitation of our club. The Lithuanian star was born in 1983 and became world champion of girls under 12 at that tender age. She progressed steadily and became a strong youthful appearance also in male competitions. 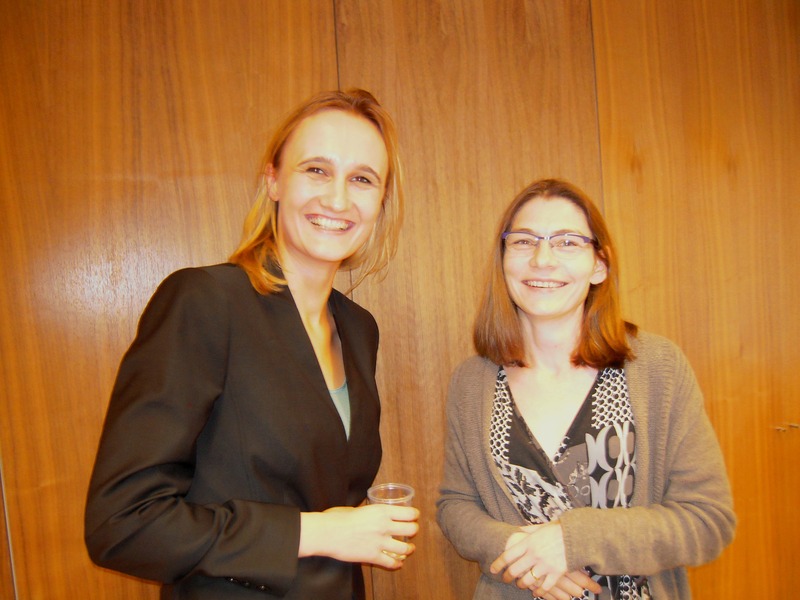 In 2005, she won the national championship of her country, letting some Lithuanian chess coryphées behind her. The GM title followed in 2010. She has a steady ELO ranking around 2500 and belongs to the Top Ten of the women in the world. Our club was thus very privileged to welcome her in the premises of the Lithuanian Permanent Representation for a lecture and a simultaneous display. On behalf of the Ambassador Marius Dunda from the Representation greeted GM Cmilyte. He stressed that it was an honor for the Lithuanian Presidency of the Council of the European Union that a national celebrity was taking the way to Brussels – the Embassy had thus done everything to facilitate the event. 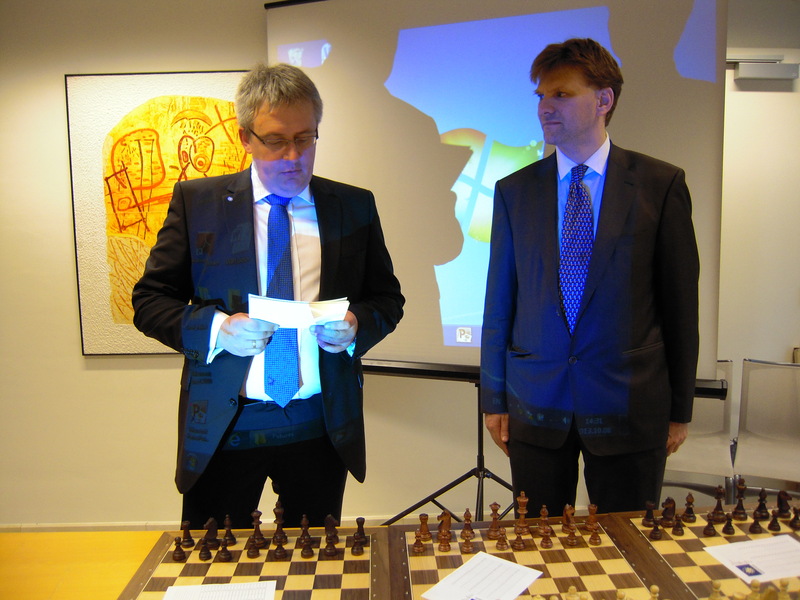 The President of Europchess, Frank Hoffmeister, thanked the Embassy for the excellent cooperation and introduced the guest to the audience. 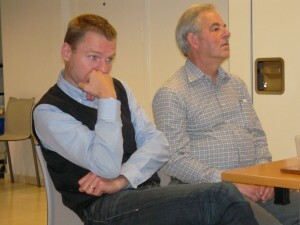 Indeed, around 25 members of the club and some Lithuanian players had shown up. 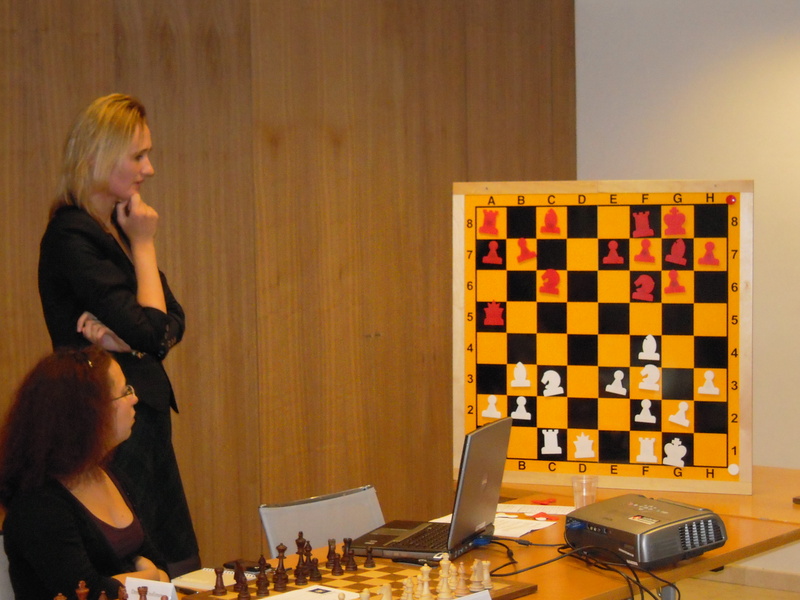 And their expectations were not disappointed – rather, to the contrary, Viktorija delivered an outstanding performance both in her lecture and the simultaneous match afterwards. She had selected an important game from her career, namely the fight against Katerina Lahno from Ukraine, another female top player. In that game, she could finally use an opening preparation that her partner, GM Peter Heine Nielsen, and a few friends had developed against the very popular Gruenfeld Defence. This line was an attempt to create some winning chances for White through a risky pawn sacrifice on the kingside. After the ordinary moves 1. d4 Nf6 2. c4 g6 3. Nc3 d5 4. Nf3 Bg7 5. Bf4 0-0 6. e3 c5 7. dxc5 Qa5 8. Rc1 dxc4 9. Bxc4 Qxc5 10. Bb3 Qa5 11. 0-0 Nc6 12. h3 Bf5 13. Qe2 Ne4 14. Nd5 e5 an important crossroad is reached. Instead of the usual move 15. Bh2 she opted for 15. Bg5, allowing 15…Nxg5 16. Nxg5 Qd8. This position looks good for Black if White retreats the knight, but now the surprising 17. h4 follows. The idea is to start a very sharp fight with 17…h6 18. g4 Bd7 19. Ne4 Qxh4 20. f3 Kh8. Although White is a pawn down and his king position looks rather lose he can actually launch a pretty dangerous attack with 21. Rf2! (N). This improves over the previously played 21. Kg2. That move has the disadvantage to block the queen on e2, which might also have to move quickly to h2 in some lines. Viktorija then went into the details of this fascinating game. It culminated in a double rook sacrifice on moves 23 and 25, which also had been on the board at home! She admitted that she was very excited when she finally was able to implement this analysis in a real game, clearly showing the subtleties of today’s preparation. Probably one may say that such preparation has left the pure opening far behind, but can even lead to the end of a sharp middle game and direct mate! In the end, GM Lahno was however, able to escape with two rooks against a queen when Viktorija took back on f6 in the wrong way. A nice stalemate led to a sharing of points. You can find the original game here http://www.chessgames.com/perl/chessgame?gid=1654355. 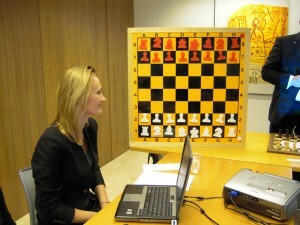 GM Cmilyte then added a few thoughts about women chess. She reported that she was often asked why top chess in the world was still dominated by men. In her view this had nothing to do with brain power, mathematical skills or anything the like. Rather, she made the observation that the top male GMs were simply more thrilled by the game. They would not mind spending more than 10 hours a day on chess, whereas many female players still had other priorities in life. After all, chess was a “war game”. Also the “girl’s tournaments” would not help because getting at the real top is only possible if one were to play stronger opponents. That had been the recipe of the strongest woman of the world, Judit Polgar, who refused to play female tournaments early on. So, it was more of a sociological phenomenon, which needed more research, the sympathetic and open grandmaster concluded. After these interesting insights into her home laboratory, a number of volunteers sat down at the board to play with her “face to face”. Viktorija was warned about the exceptional strength of the club from last year’s performance from GM Peter Heine Nielsen. So she apparently did not take too many risks, playing solid lines. This strategy paid off, as she only had to give in three times, conceding a couple of draws, but winning the clear majority of her games. 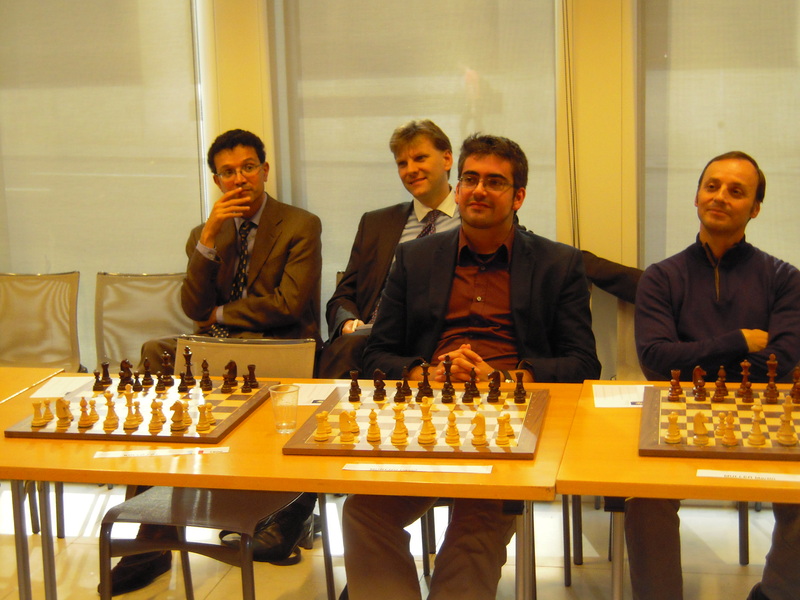 From Europchess, FM Georgi Tomov, Johannes Bertram and Edit Köllö defeated the champion, whereas Frank Hoffmeister, Svetlozar Andreev, Christophe Keller and Jose Maria Ramos Florido got a draw. Games will also be added to this article later, based on voluntary contributions of the players. The final result thus was 17,5 – 5,5. 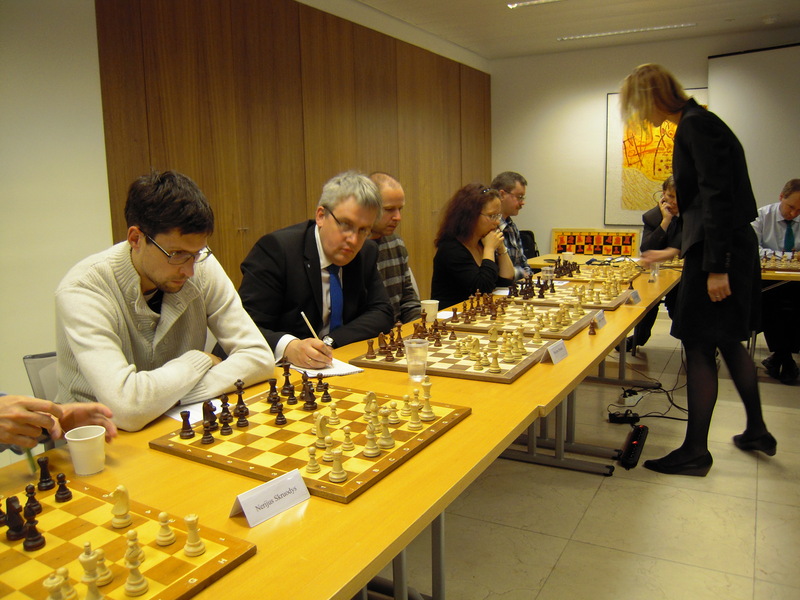 At the margins of the chess events, GM Cmilyte also enjoyed the hospitality of the club. Club members showed her the premises of the Commission and the European Parliament and invited her to a nice restaurant in the evening. This rounded up a remarkable visit and outstanding performance of one of the most interesting women players in the world these days.